Chinese President Xi Jinping's speech on Tuesday at the conference commemorating the 40th anniversary of China's reform and opening-up enhanced Chinese people's confidence in further reform and opening-up, which Xi said would face tougher responsibilities and severer challenges. In the speech, Xi stressed staying on the path of socialism with Chinese characteristics and upholding and developing socialism with Chinese characteristics, the Xinhua News Agency reported. Under the support of Deng Xiaoping and other revolutionary leaders, the 3rd Plenary Session of the 11th Central Committee of the CPC reestablished the Marxist ideological, political and organizational line, opening the curtain on reform and opening-up, Xi said. All the theories and practice of the Communist Party of China (CPC) in the past 40 years of reform and opening-up are based on the theme of upholding and advancing socialism with Chinese characteristics, he said. Socialism with Chinese characteristics provides a broad pathway for China to advance with the times and steer the course of development today, Xi said. "We will resolutely reform what should and can be reformed, and make no change where there should not and can not be any reform," he said. "The fundamental criteria to decide what to reform and how to reform relies on whether it accords with the target of improving and developing the socialist system with Chinese characteristics and promoting the modernization of the national governance system," Xi said. Reform and opening-up demonstrated "the nature of socialism with Chinese characteristics," said Zhuang Deshui, deputy director of the Research Center for Government Integrity-Building at Peking University. Reform and opening-up breaks institutional obstacles and creates the path for the cause of socialism with Chinese characteristics, Zhuang said. The success of reform and opening-up assures the success of the cause of socialism with Chinese characteristics, Su Wei, a professor at the Party School of the CPC Chongqing Committee, told the Global Times on Tuesday. Meanwhile, 10 foreigners were honored with the China Reform Friendship Medal. "We have heard pledges that China is committed to continued reform and opening up, including statements by President Xi Jinping today," a US Embassy spokesperson said in a statement sent to the Global Times on Tuesday. China's sincere commitment to market-based trade and investment norms would be good for the US, the world, and especially good for China, the statement said. "We believe that US companies played an important role in reform and opening through investment and job creation." Xi's speech frustrated those who expected to see China make concessions under trade pressure from the US, Su said. The speech enhanced Chinese people's confidence in deepening reform and opening-up on the path of socialism with Chinese characteristics, Su asserted. 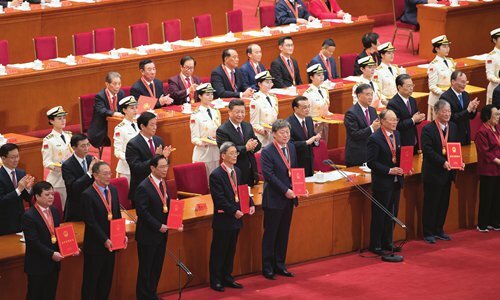 The CPC has made many plans to deepen reform in previous meetings and sessions, but Xi's speech this time provides practical guidance for the country to implement these plans, Su noted. Xi outlined nine principles guiding a new round of reform and opening-up, including adherence to the leadership of the CPC, people-centered approach and opening wider. Zhuang noted that the leadership of the CPC is a key to the success of the reform and opening-up as well as a core value of socialism with Chinese characteristics. The people are the foundation of the CPC, he said. Tom Rafferty, an economist at The Economist Intelligence Unit, told the Global Times that Xi's speech was a reaffirmation of the role played by "reform and opening" in modernizing China's economy and a commitment to keep pushing it forwards. William Zarit, chairman of American Chamber of Commerce in China, told the Global Time that "we know that China doesn't want a trade war, so we are optimistic that real opening-up can still take place before the 90-day window closes on March 1." When China launched its reform and opening-up, the country's GDP was 367.9 billion yuan ($53.3 billion). That grew to 82.7 trillion in 40 years. China now makes up around 15 percent of the global economy, up from 1.8 percent, according to Xinhua. Looking forward, Xi noted that there is still a long journey on the road of reform and opening-up and Chinese people will face tougher responsibilities and severer challenges in the future. One difficulty is to comprehensively combine the public sector of the economy, particularly State-owned economy, with market mechanism and to further reform State-owned enterprises, Su said. He pointed out another difficulty lied in integrating domestic market system, including capital, technology and talent, with the global market.